Groundscape Solutions, a Fort Worth Landscaping Company, Installs a multicolored Stone and Mortar Edging/Curbing around a Flower Bed With a matching Tree Ring. 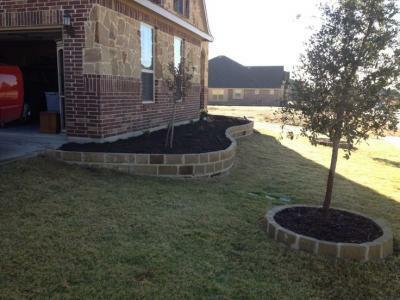 This Curbing/Edging provides a nice seperation of the flower beds from the lawn. Give us a call at 817-759-0102 for a quote and visit us online at Groundscape Solutions is a fully insured landscaping company and will provide references.